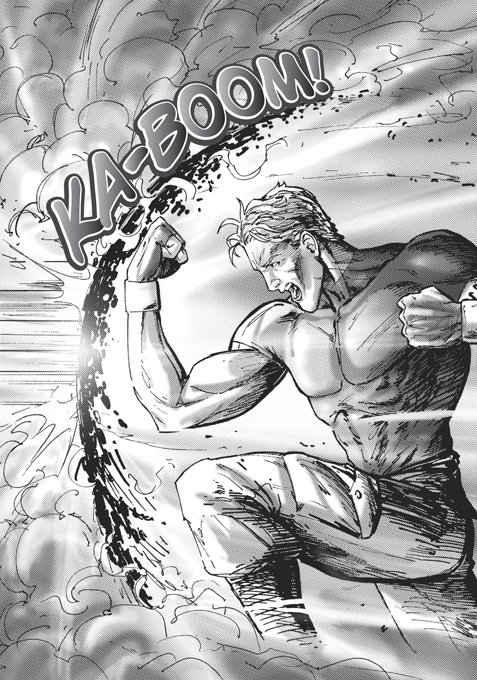 We have recently fallen in love with Zondervan’s Hand of the Morningstar manga series, co-published by Lamp Post. The only thing that makes us mad about it is the length of time it takes to produce each volume. But, each volume of the series—Four [as of the date of this article]—is so good, we’re willing to wait it out. In the meantime, we requested to spend some time with series creator and co-writer, Brett Burner. He has graciously agreed to answer some of our questions. Brett is a printer and publisher and is active in youth ministry. He formed Alias Enterprises, Cross Culture Entertainment, and Lamp Post Publications with the aim of bringing high-quality and innovative Christian books and all-ages comics to stores to edify and entertain today’s youth. PS. We’ve been given an exclusive first look at some of the art for Hand of the Morningstar: Indoctrination, the fifth volume in the series. TCM: First, we’d like to thank you for taking the time to sit down and answer some of our questions. Your work on the Hand of the Morningstar series is really fun to read. Brett Burner: Thank you. That really IS the ultimate goal…to read something truly edifying but really fun. 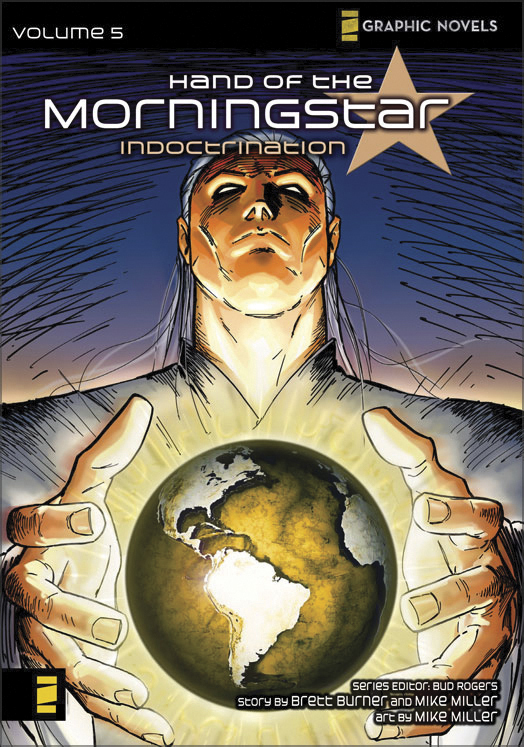 Hand of the Morningstar has been equally fun to produce…it’s a true labor of love! TCM: Tell us a little about yourself. How did you get your start in comic books? BB: I kind of fell into comics. I’ve been in printing and publishing for 15 years, with all the ups and downs that go along with it. Then one day, through a series of events, I met my friend Mike Miller, who has been a long time comic artist. A lot of long and late night talks spiced with the excitement of a new project brought about Alias Comics…and there I was…in the world of comics! TCM: Can you tell us anything about Lamp Post Publications? When you’re looking for stories, writers, artists, what guiding principles direct your decisions? BB: The goal or mission of Lamp Post is to provide quality Christian content in all genres. Lately we have been branching out into more than just comics (shameless plug: see www.lamppostpubs.com) with novels and devotionals and the Christian Classics. But with our stories (comics/graphic novels, novels, short stories, youth books, romance…), the thing I am looking for most is something that will edify the reader. I like a story that in some way the reader will say, “I can identify with this!” I read a novel once where one of the characters brought up a verse and it really spoke to my heart…in fact, it made my day. We need to be edifying and encouraging. That doesn’t mean there is always a hunky-dory happy ending and tons of fluff, but rather we can present a challenge that will build up the reader’s faith…young or old! TCM: What prompted the idea for the Hand of the Morningstar series? BB: I remember the conversation! Mike says, “We need a BibleMan!” I said, “No! We need the opposite!” Whenever I see a “Christian-Superhero” story, the premise is always (I will say “typically”, but to date I have never seen otherwise) that the main character is somehow endowed with super powers by God and sent off on a mission of righteousness with these powers. My view is that we ALL are given this mission—“…to do justly, to love mercy, and to walk humbly with my God,” Micah 6:8. So how does that translate to a superhero such as Spiderman, the Hulk, or the Fantastic Four? Take a guy that happens to have super powers, then make him a Christian. How does he act? I worked out the story in my head and ran it by a few people, then one night I scribbled (literally) the outline down on a piece of paper. I still have it here in arms’ reach…kind of a reminder to get to work!! TCM: Who would you say is your key demographic for this manga series? 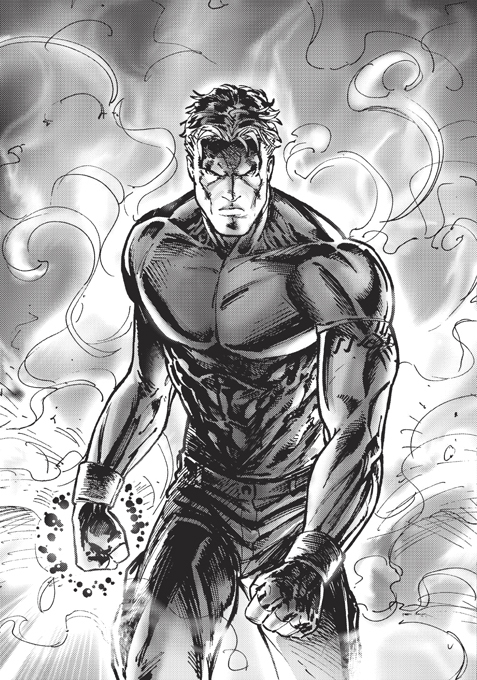 TCM: Beyond the obvious Christian content, what would you say are some of the key differences between Hand of the Morningstar and other manga series? BB: I might say it’s the only REAL difference. I suppose as far as “manga” goes, classic Japanese style manga, that this is more traditional American style…but as for content…it’s a solid story that brings the reader back for more. And I would suggest that even readers that are NOT Christians would enjoy the story for its own merit…though they might not understand some of the WHYs. TCM: There’s a lot of misdirection in your story. In other words, readers are led to think one thing and then those things get twisted around. Tell us a little about the writing process. Do you set out with a specific agenda in mind, or is it more an organic thing? BB: Yeah, as I mentioned earlier, the concept was pretty well wrapped up before script one was started. We knew right where we were going with it, and the mis-direction is intentional. Actually, this presented a problem! At the end of ADVENT (Book One), you’re not sure who the good guys really are…and the story’s true hero doesn’t become evident until Resurrection (Book Two). The problem is, we decided the Christian Market might misinterpret where things were left off in Book One (and they would…we did it intentionally!!) So we added in a scene to show something was downright wrong with one of the characters… I didn’t want to reveal it so soon, but it became a bit of a necessity for the acceptance of the book. TCM: The art of the series really is high-quality. In the past, Christian comics have tended to be merely alternatives to comics found in the general market. How do you think that is changing? BB: Thank you…yes, I am very pleased with the quality of art in this series. 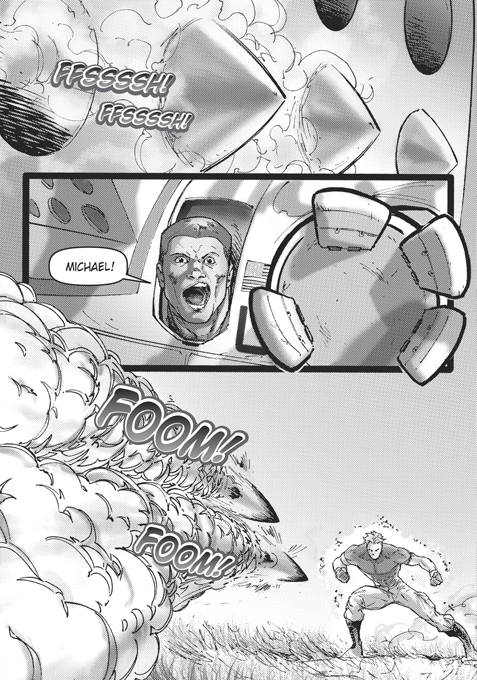 Mike Miller’s work is impeccable, and as of Book Three, Eric Ninaltowski took over. He’s doing a great job, and books Four and Five are pretty hot!! 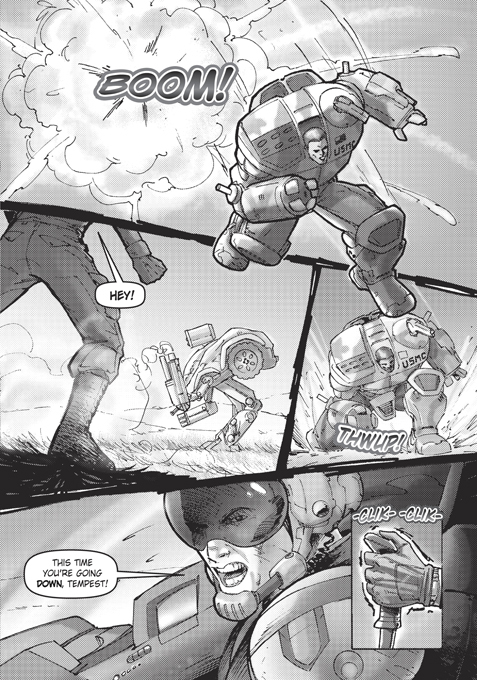 As for Christian Comics in general, the market’s changed a bit… Through Alias, we worked with some great artists and studios (Gary Shipman, Tom Bancroft, Community Comics and others I’m probably forgetting) to bring out some very high quality work. These titles are now a part of Lamp Post. There are some other guys I’d tip my hat to out there as well…most notably the guys working with Zondervan, or Buzz Dixon and his Serenity series. One of my favorites is a guy named Dean Rankine out of Australia (classic!). But unfortunately, as a whole, I think Christian Comics are still trying to find their footing. TCM: The comic book industry, both foreign and domestic, is booming right now. Comic book artists are reaching superstar status. Comic conventions are on the rise. Fans are buying multiple copies of titles. Many comics have been optioned as films. Superman. Batman. Iron Man. Speed Racer. Voltron. The Incredible Hulk. There seems to be no end in sight to the superhero genre. What do you think it is about comic books and superheroes that appeals to people, both children and adults, on such a fundamental level? BB: Unfortunately I think this is a bit of a misnomer. Comics, the genre, and superheroes seem more popular than ever, but really it’s just because they are coming out with more movies and TV shows…but the market itself is hurting. I would qualify that by saying “that’s my opinion,” but it has been shared widely. The biggest hit is on the Indie market. Marvel and DC are doing just fine (and more power to them…they’re doing great work), but the indies have been hurt by their successes, and COMIC sales are way down (even for Marvel and DC). That said, superheroes are so popular because we all wish we were one! I asked my young adult bible study the other night “Which superhero would you be?” They all had a quick answer…it had long been thought through–mostly because we all want to do something incredible! So we are drawn to those that can, and we want to live vicariously through them. That’s an interesting thing as a Christian. We all want to be “warriors”, but it seems so unglamorous to be a “prayer warrior”. We can’t imagine doing great and amazing things with our eyes closed and on our knees, and no matter how many times we picture ourselves “standing in the gap” and “wielding our swords” and “doing spiritual battle against powers and principalities”…it seems less satisfying than flying through the night to fight crime and bring justice to the wicked. I know it’s hard for me! Oh! I could go on and on…but my greatest accomplishment would be to learn how to do just that…effectively enter into prayer and truly stand in the gap and make a change! TCM: What have been some triumphs and frustrations you’ve experienced working as a Christian comic book artist? BB: The triumph is in seeing your book in print, then passing it off to someone and having them truly blessed by it. I sent copies of 1-3 to my nephews in Africa…when they finally came home recently, they blew through the front door right past me without so much as a “hi” and demanded “Where’s Book Four!” I love it! The difficulties are in the market. It’s a niche market of a niche market. Comics are tough enough. Christian books are tough enough. Now we enter into the difficult Christian Book market with comics and we find that they don’t understand them. They aren’t sure what to do with them or where to place them in the store. They are not even sure if the books are okay…Christian Comics are undergoing many of the same hurdles that Christian Music went through over the last few decades…so it’s a tough climb. Maybe one day we will see a genuinely successful Christian Comic…till then I just need to be happy putting out good ones!! TCM: What, if any, helpful critique do you feel you have received regarding your work? BB: My editor, Bud Rogers, is AMAZING (ya hear that, Bud?)! He’s been really helpful in maintaining consistency. When you are so familiar with the story, you can lose your objectivity. On top of that, we are doing two other series with Zondervan (Kingdoms and the Manga Bible—shameless plug number 2! ), so he helps keep the storyline strong. Zondervan in general has been great with all of this. Other than that, it’s been live and learn…and I’ve had to do a lot of learning in comics through the years…sometimes the hard way. TCM: What is next on the docket for you in terms of writing? BB: You know? I’m not sure! I’ve been wearing my publisher hat a lot lately, exploring some things, and putting a lot of feelers our for new content (content guidelines on our website—um…shameless plug number 3!! ), as I mentioned earlier. I am really trying to build something that works well for our creators and authors. In all honesty, I’m not sure we got that right the first time (with Alias). TCM: Thank you again for taking the time to answer some questions for us. Any final thoughts? Other than that…God bless you all…seek Jesus with all your hearts…do justly, love mercy, and walk humbly with our God!! !